Digital readouts from HEIDENHAIN increase productivity, save time and provide higher precision and greater operating ease. They can be installed on new equipment or retrofitted to machines already in operation – whatever the machine’s application and number of displayed axes. HEIDENHAIN digital readouts have universal applications. In addition to standard tasks on milling, drilling and boring machines and lathes, they also can be used with machine tools, measuring and testing equipment, and special machines – in fact, they can be used with any machine where axis slides are traversed manually. See below for model specifications. Digital readouts for simple positioning tasks with up to 4 axes inputs. ND1100s are mainly suited to positioning tasks on positioning equipment and measuring fixtures, as well as for retrofi tting on measuring machines for data acquisition and relaying to a PC. The ND 1100 QUADRA-CHEK digital readouts have a 5.7 inch monochrome flat-panel screen for displayed values, dialogs, inputs and soft keys. The robust, diecast aluminum enclosure meets the demands of metrology and production control. The ND 1100 has an RS-232-C/V.24 serial interface for communication with a PC. You can connect printers or memory media directly to the USB port. Touch probe ready. Acceptable inputs include 1Vpp and TTL signals. Digital readouts for optical comparators with up to 4 axes inputs. The ND1200s digital readouts can support up to four axes, and function as measuring computers for 2-D geometries. They are mainly suited to optical comparators, measuring microscopes and 2-D measuring machines. The ND1200 QUADRA-CHEK digital readouts have a 5.7 inch monochrome flat-panel screen for displayed values, dialogs, inputs and soft keys. The robust, diecast aluminum enclosure meets the demands of metrology and production control. Predefined features (point, line, circle) are available for measurement. The `Measure Magic` function makes measurement especially easy: it selects that feature which best matches the shape implied by the points probed. In addition, you can establish relationships (distances, angles) between features. The ND1200 has an RS-232-C/V.24 serial interface for communication with a PC. You can connect printers or memory media directly to the USB port. Touch probe ready. Acceptable inputs include 1Vpp and TTL signals. Digital readouts for convenient 2-D measurement acquisition. The ND1300 QUADRA-CHEK digital readouts can support up to four axes. They function as measuring computers with 3-D acquisition of measurement points, suiting them for measuring microscopes, measuring projectors and profi le projectors, as well as for video measuring machines if the video edge detection option is selected. The ND1300 QUADRA-CHEK digital readouts have a large 8.4 inch color touch screen which enables simple operation guidance for displayed values, dialogs, inputs and soft keys. The robust, diecast aluminum enclosure meets the demands of metrology and production control. Magic` function makes measurement especially easy: it selects that feature which best matches the shape implied by the points probed. In addition, you can establish relationships (distances, angles) between features. The ND 1300 with video option optimally combines in one unit the functions of a position display unit with the capability of displaying the image of the measured object directly on the screen. The CNC option lets the ND 1300 work as a full-fl edged control, directly controlling the positioning of the X, Y, Z and Q axes. The ND1300 has an RS-232-C/V.24 serial interface for communication with a PC. You can connect printers or memory media directly to the USB port. Touch probe ready. Acceptable inputs include 1Vpp and TTL signals. Digital readouts for Manual 3-D Measuring Machines. The ND1400 QUADRA-CHEK digital readout supports four axes: in addition to the linear axes XYZ it features an auxiliary axis Q solely for angular display. The readout is designed specifically for manual coordinate measuring machines, and can capture two- and three-dimensional features with its measuring computer functionality. 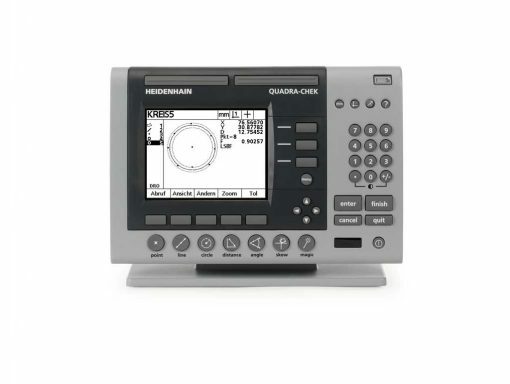 The ND1400 QUADRA-CHEK digital readouts have a large 8.4 inch color touch screen which enables simple operation guidance for displayed values, dialogs, inputs and soft keys. The robust, diecast aluminum enclosure meets the demands of metrology and production control. Magic` function makes measurement especially easy: it selects that feature which best matches the shape implied by the points probed. In addition, you can establish relationships (distances, angles) between features. The ND1400 with video option optimally combines in one unit the functions of a position display unit with the capability of displaying the image of the measured object directly on the screen. The CNC option lets the ND1400 work as a full-fl edged control, directly controlling the positioning of the X, Y, Z and Q axes.